Meetings are informal open houses, where you can view displays, chat with State Parks staff, ask questions, and leave written comments. The State Parks Rock Island Corridor page includes summary of the informational displays at the meetings and a form for submitting comments. You can complete a survey and make your comments online here. Online comments open through November 30th, 2018. Your comments are so important! Most important comments to make . . .
You strongly support the trail and feel State Parks is the best organization to take over and manage the entire corridor for the long term. It is imperative that, above all, the entire corridor be preserved intact for the future. Now is our one chance to preserve the entire corridor intact--we won't get a second chance. State Parks must balance the pressing needs of the existing State Park system against the opportunity presented by the Rock Island corridor. The 144-mile Rock Island corridor--combined with connecting Katy & Rock Island Trails to make a statewide trail system of over 500 miles, is too immense and important an opportunity to overlook, and State Parks should accept and manage it--but should look primarily to outside funding and resources to develop the trail. Given State Parks' budget pressures, what is the minimum investment needed from State Parks in order to preserve the corridor now and allow the trail to be developed over time by outside funding sources? If State Parks can sustain that minimum required investment, then they should move as quickly as possible to preserve the corridor for posterity. Please view trail development as a major, innovative state-local-public-private partnership. We expect the trail construction, development, and ongoing operations to be funded over a potentially long period of time from a wide variety of sources--not solely or even primarily from State Parks funds. We ask that State Parks take on the role of managing the entire corridor and working with local and private entities to develop the entire corridor over time--perhaps a long time. We understand that State Parks has limited funds and cannot possibly develop the entire trail using its own funds. But we do not expect State Parks to do so. We ask them to preserve the entire corridor and then work over time with cities, counties, and private groups to develop the trail section-by-section as funding from outside sources becomes available. We don't expect the entire corridor to be built and maintained to highest-level standards--and certainly not from the very start. It is OK to create a variety of standards of trail quality and build to lower or higher standards as funding becomes available. This is a very important infrastructure and workforce development initiative for a rural area of Missouri that very much needs this type of investment over the long term. It is very much worth modest investment of State Parks resources and commitment over the long term, in large part because that modest state investment in the region will snowball into far greater local, public, and private investment in the corridor and the region. It is economic development not only in terms of regional tourism, but--even more important--in terms of talent-retention, attracting business and residents to an active and vital region, and creating health and quality-of-life in a currently underserved rural region of Missouri. We have been working with our partners the Missouri Rock Island Trail, Inc. and the Rails-to-Trails Conservancy, along with many other organization partners and thousands of supporters across Missouri on the Rock Island trail for many years. In January we met with Missouri State Parks leadership, who indicated they plan to spend several months developing a detailed plan for the Rock Island corridor, including realistic assessments of obstacles and cost, realistic and creative approaches to overcoming the obstacles and funding the project over a realistic time frame, and alternatives to be considered. We now expect that plan and those alternatives to be presented to the public for your consideration and thoughtful feedback. It is critical that park supporters attend as many of these meetings as they can and submit substantive written comments, as the quality and quantity of these comments may well be a decisive factor whether the state agrees to take possession of the corridor when it must make its decision by February 2019. There will be information provided at the open-house-style meetings and park officials will be present to discuss the potential effects on communities, citizens and Missouri State Parks if the corridor were to be developed into a long-distance recreational trail. Information will include the potential costs of trail development and operations; public safety, landowner and legal issues; environmental and natural resource issues; and property management options. There will be comment cards available at the meetings, and it is absolutely critical to submit substantive written comments. In your written comments, whether submitted on cards at the meetings or on-line, it is not enough to say that you want the state to take possession of the corridor from Ameren, which has indicated its intent to donate it. Rather, it is critical to address the substantive issues involved, recognizing that Missouri State Parks simply does not have the funds ($50 million or more) required to deal with the technical problems or to develop, operate, and maintain the trail in the forseeable future. Park officials will thus be interested in possible partnership models for financing, developing and operating the trail as a whole, or potential partnerships for developing and maintaining certain segments of the trail. This is why it is so important to attend the public meetings, if you possibly can, in order to learn more about the issues, and to submit substantive written comments. 12,000 comments in support of the Rock Island made a huge difference in 2014 with Ameren and then-State Parks leaders. Now with new State Parks leadership and a new Governor, we need to do it again in 2018. Ideas for your comments: How will the new trail affect you and your community? How will the trail affect you and your community? Do you support the trail? Will the trail positively affect you, your family, your town or neighborhood, your business? Be specific if you can. Will the new 144-mile section bring a state park to an area of the state currently underserved by state parks and by trails? Because the trail goes directly through many rural communities, tourism and economic impact will be more immediate and direct than it was even for the Katy Trail. This is a portion of the state that very much needs investment in major economic development initiatives such as this. 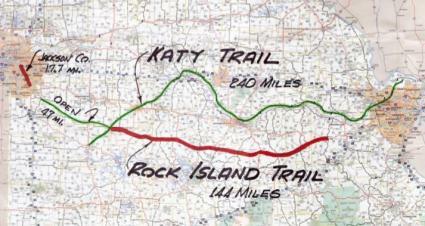 Will the combination of the Katy and Rock Island Trails along with other connecting trails into a statewide interconnected system over 500 miles in length impact tourism and quality of life in the state as a whole? Do you foresee economic or other benefits to your community, your business, your self and your family, or the state as a whole? We need comments from people who live close to or on the trail, but also from the entire corridor region, the entire state, the entire country--and the entire world. This is potentially a world-class, internationally significant trail destination. Let State Parks know that in very definite terms. 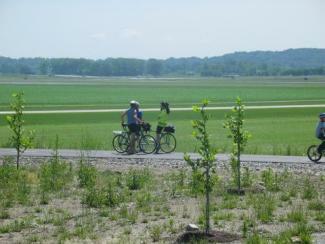 The Rock Island Trail is not just a trail or a State Park. It is a major rural economic development initiative in a region of the state that very much needs this type of investment. 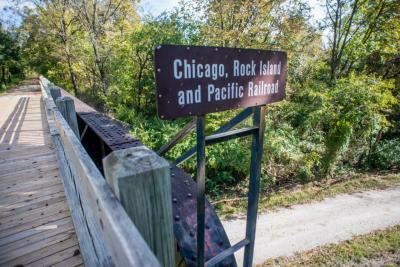 As part of a statewide and (eventually) multi-state trail system system potentially totalling well over 700 miles of connected trail, the Rock Island Trail will be a major national and international tourism destination. But just as important, for the people, businesses, and communities along the trail, it puts a world-class recreational destination right at their front doorstep. This type of outdoor recreational opportunity enhances the economic viability of the entire region, helping attract and retain young people, families, businesses, and residents. This region of Missouri is currently very underserved both in availability of trails and safe places for outdoor recreation like walking, hiking, and bicycling and in the general availability of state parks and other public recreation spaces. Rural regions that want to remain vital and attract and retain young people, families businesses, retirees, and others to move and stay in the region are investing in just this type of economic development initiative that focuses on enhancing outdoor recreational opportunities, health, and quality-of-life. Trails are among the most popular outdoor recreation amenity among people of all ages in Missouri; people seek out places that have parks and trails--and avoid those that lack them--because of importance to quality of life and health. The trail is the type of outdoor recreational opportunity that will co-exist well with and enhance the region's existing quality-of-life and recreational opportunities, including hunting, fishing, waterways, and agritourism. We have seen major success with similar projects in the Midwest, including the Northwest Arkansas trails system, the Raccoon River Valley Trail in Iowa, and Missouri's Katy Trail. Regions that invest in themselves in this way grow and thrive; those that do not inevitably lose their young people, businesses, and population. Bringing trails to rural Missouri communities has strong positive impact on public health, including rates of high blood pressure, stroke, diabetes, obesity, and more. The gains in physical activity are most significant in rural places with few parks and narrow road shoulders. Increased physical activity is greatest among people at greatest risk of inactivity, including people with low income, low education attainment, and the elderly. Research has found that the benefits of reduced health care costs associated with increased physical activity on trails far outweigh the costs of trail construction. Ideas: What are the challenges State Parks sees to accepting the corridor and building the trail? Building a trail of this length and scope presents challenges. State Parks is looking for specific ways to overcome the challenges, including funding. Very important and substantive to the decision would be comments that provide concrete ideas for funding and--particularly--concrete offers to support building or maintaining the trail. #1. The cost to State Parks simply to accept and manage the corridor, even without making any improvements to it or building the trail. #2. The cost of actually building the trail and dealing with particular infrastructure along the route, such as major bridges and tunnels. Let's be clear: These are obstacles faced by every major trail that has been built in the world, and indeed every project of this size and scope. Thousands of trail success stories from around the world, around the U.S., and around Missouri give us strong evidence these obstacles can be overcome. But State Parks needs to hear that we understand the difficulties and support realistic solutions. 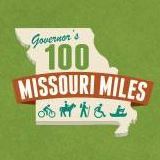 State Parks then works with cities, counties, foundations, businesses, and others along the trail and around Missouri to combine available private funding and grant opportunities that already exist with volunteer labor and in-kind donations to build sections of the trail over time. 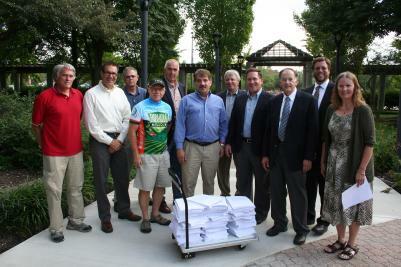 Willingness to submit applications and administer grants for construction of portions of the trail. Willingness to provide in-kind labor, equipment, or volunteer time. Willingness to support spending a portion of existing federal or other grant funding on this project--particularly if you or your agency is involved or has a say in the grantmaking process. Your support for allocating general state budget funds, existing State Parks funds (stretched thin already, remember) or new revenue sources to cover State Parks annual administrative and staff costs to oversee the trail. According to one estimate, annual cost to State Parks will be about $100,000 for annual staffing and basic administration. Willingness to adopt a portion of the trail for building or ongoing maintenance, or even basics like trash pickup. Personal willingness to donate to a Foundation or other similar way of supporting construction, ongoing operation expenses, or maintenance of the trail. Willingness to consider and support park fees, fundraising, donations, or other means to cover part of State Parks annual operating expense for the next trail. Concrete ideas for practical ways to deal with fencing, corridor crossings, road crossings, public access, ongoing cost to State Parks, and other issues affecting the corridor and neighboring landowners, in any interim period between corridor acquisition and the time the trail is open to the public. Don't underestimate the power of saying, "I will step up to be a trail volunteer" or "I would personally support the trail with the amount I can afford." Your contribution needn't be millions--they want to know whether or not people's support goes beyond lip service. You support the idea of State Parks holding the trail and working over the long term-perhaps decades--with local communities, foundations, businesses, and agencies to build sections of the trail as various sources of funding become available. Many long, connected sections of the trail could be opened at very low cost as "mountain bike and rough-hike accessible". As funding becomes available, these sections could be upgraded to Katy Trail quality over time. Over 80% of the trail could be opened soon using this approach. Remaining more difficult sections, like major bridges and tunnels, are also by far the most important and iconic attractions for long-distance tourists. Funding for this type of larger, iconic project tends to become available over time--as it has, for example, with the Boonville Bridge. In the meanwhile, bypass routes can be explored. If we give up these major tourist attractions and historic landmarks, they are gone forever. About 50 miles of the corridor lies within city boundaries, so cities can step up to take the lead in developing and maintaining these portions, if State Parks will take the lead in adminstering the entire project. You live anywhere in the Greater St. Louis region, which will connect to the 144 mile Rock Island section via the Katy Trail at Washington, and also potentially also via new connections south of the river through western St. Louis County. You live on or near the Rock Island Spur from Windsor to Pleasant Hill, which now connects to the Katy and will connect directly to the new 144 section. 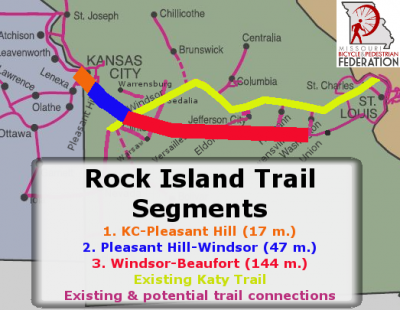 You live anywhere in the Greater Kansas City metro area, where Jackson County and the KCATA have recently spent upwards of $60 million acquiring their portion of the Rock Island corridor and building the first section of trail. 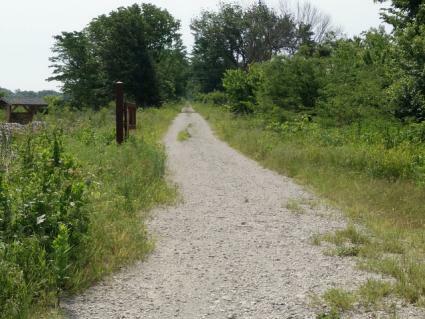 This trail will plug into the Kansas City regional trails & bikeway network, giving the entire metro area direct access to the new 144-mile Rock Island Trail section over time. You live anywhere close enough to regularly visit the new trail--whether a few times a week or a few times a year. You live elsewhere but plan to visit the trail on special occasions. Remember that those visitors have the most impact on local economies. State Parks needs to know that you will visit, spend time in communities, and spend money in trail communities, if they build it. Ideas: Piecemeal? Just give up the corridor? Do you support the idea of State Parks accepting just portions of the corridor, or should they accept the whole corridor? The longer the trail system, the further tourists will travel to visit it, and the longer they will stay. A piecemeal system doesn't accomplish that goal. An intact 144-mile corridor as part of a great 500+ mile statewide trail system has many times the value of, say, two 50-mile disconnected segments. The long-distance travelers who stay longer are by far the most lucrative tourists and have the most impact on the local economy. They won't bother traveling to visit small, segmented trails. If Missouri State Parks gives up the opportunity to accept the corridor, what is lost? 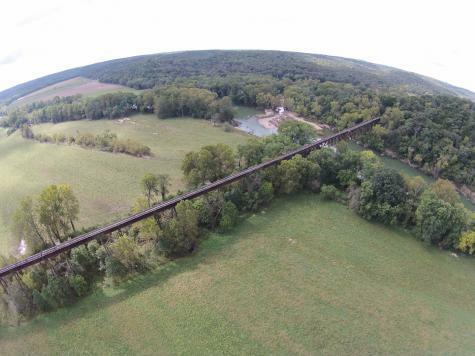 This is our one and only opportunity to accept Ameren's donation of the land--valued at over $10 million--and hold the corridor together for use as a trail or any other purpose. If we miss this opportunity, the corridor will be broken up into hundreds of small parcels, with no chance of ever putting it back together again. The Rock Island will be lost forever. Leaders and citizens should see this as part of our legacy for the future and our gift to our children and grandchildren. Opportunties for a trail of this significance, and with this much impact on the state, its rural AND urban communities, its economic, and its citizens, come along only once in a lifetime. We can't let this once-in-a-lifetime opportunity go to waste. Attendance at these meetings is vital. Within the past two years, State Parks considered doing away with three new state parks, holding public meetings at several locations around the state near the very remote and isolated new state parks. Despite the difficulties of travel, many people made the effort to attend the meetings and to submit comments if they could not travel. Those personal visits and comments made the difference: State Parks decided to keep the state parks and, despite limites resources, preserve them for future use and development when resources are available. 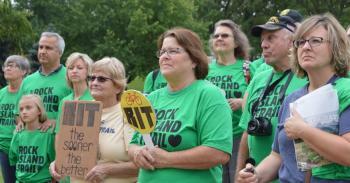 We can make the same difference on the 144-mile Rock Island corridor--but we have to show up! Please plan to travel to meetings if you can. If you cannot, we will let you know as soon as a way to provide public comment online is available. If State Parks accepts comments, the link will likely be on their Rock Island Corridor page. 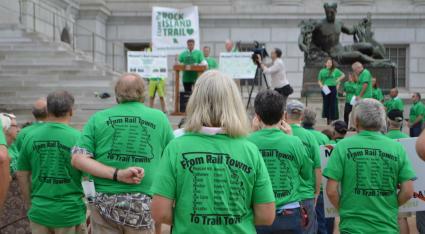 Missouri Rock Island Trail, Inc., is the coalition of trail supporters all up and down the Rock Island corridor and from around Missouri and the U.S. Please support their work! » Next story: Prop D, Missouri fuel tax proposal on Nov 6 ballot: What is it? What does it do for bicycling and walking?